UC San Francisco medical students sparked a national movement in December when they launched #whitecoats4blacklives to bring attention to racial health care disparities. Their act of courage inspired UCSF leaders to address racism head-on in its annual leadership retreat and has renewed a much-needed dialogue throughout campus. A group of UCSF medical students gathered in a closed meeting last month to talk about race, racism and racial disparities. They were troubled by recent grand jury decisions not to indict white police officers who were involved in the deaths of two unarmed African American men, Michael Brown in Ferguson, Mo., and Eric Garner in New York City, and wanted to channel their frustration into something constructive. The students, including many from the UCSF Underrepresented In Medicine (UIM) mentoring program, decided to hold a “die-in” at UCSF while wearing their white coats, symbolic of those in the health profession. 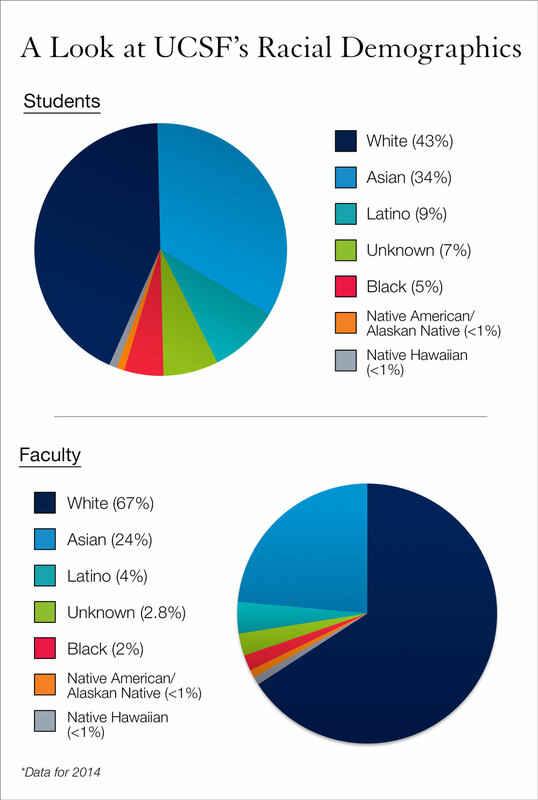 They and their peers of all ethnic backgrounds tapped into student networks across the country. In just five days, a national movement called #whitecoats4blacklives was born. It catalyzed thousands of students, faculty and staff in more than 80 colleges across the country. At UCSF, students from all professional Schools (Dentistry, Medicine, Nursing and Pharmacy) and the Graduate Division participated, as well as some faculty and staff members. The hashtag dominated social media on Dec. 10, garnering widespread media attention and sparking a much-needed national conversation about racism being more than a just criminal justice issue. The die-in had a ripple effect across UCSF. A student-initiated town hall held two days after attracted faculty members, deans and many of the University’s top leaders, who talked openly with students about the UCSF’s ongoing challenge with diversity. Chancellor Sam Hawgood, MBBS, has made race and racial inequities a priority in his administration. And organizers of the School of Medicine’s annual leadership retreat this month decided to change the event’s agenda to discuss the enduring question of race in America – and how racial dynamics play out at UCSF. “Our students are asking us to acknowledge, to think and to do something about the problem of racial and ethnic injustices,” said Bruce Wintroub, MD, interim dean of the School of Medicine, introducing a daylong colloquy that was rich in both data and personal stories about what it means to be black and brown in America. The leadership retreat, which took place on Jan. 8 and 9, was the first one ever to focus solely on race/ethnicity and health disparities. It came as the School of Medicine has launched a six-year, $9.6 million effort to hold its departments accountable for achieving diversity, provide the resources to recruit and retain a more diverse faculty, create a culture of diversity and inclusion and expand the pool of scientific talent, which gets smaller at each level of training. Some of those students were invited to participate in the leadership retreat and share their experiences with the group to help facilitate organizational change. White faculty members listened attentively, and some were candid enough to admit that they hadn’t really thought about racism and its impact on students and patients in a meaningful way. Compelling presentations and anecdotes by faculty of color helped shape the day’s conversation. Guest speaker Denise Rodgers, MD, focused on the impact of race and racism on health and health care in her talk, helping the audience to understand how a climate of violence affects their patients and their health.Neil Powe, MD, MPH, MBA, vice chair of the Department of Medicine and chief of medical services at San Francisco General Hospital and Trauma Center, shared a story about being pulled over by the police in North Carolina while in town to give a lecture. A police officer suspiciously questioned Powe about his destination, instructed him to keep his hands on the steering wheel and asked him if he had drugs in the car. This year, one-third of first-year medical students are underserved minorities (black, Latino, Native American or Pacific Islander), the highest percentage of any medical school in California. Each of UCSF's four professional schools – dentistry, medicine, nursing and pharmacy – and the Graduate Division have diversity as a priority. Learn more about what the schools are doing to improve access to education. What Role Does Race Play in Research? The retreat featured several faculty research presentations on how persisting in asking why some diseases or drugs affect people differently by race has lead to fundamental discoveries in disease mechanisms, as well as better clinical care. Despite having one of the most diverse student populations in the nation, a recent survey found that nearly one-third of students who are black, Latino and Native American reported feeling shunned or ignored or having experienced behavior they found intimidating, offensive or hostile, and 21 percent said it interfered with their ability to learn. That was double the percentage reported by whites and a third higher than reported by Asians. Talmadge King, MD, chair of the Department of Medicine, said the medical school is doing well at recruiting students, but many are not staying for their residency training. Retention drops more at the fellowship training level and then essentially stops at the faculty level. Similar statistics also apply to the other professional schools and the Graduate Division. Meanwhile, the students who organized the #whitecoats4blacklives event have formalized the creation of the national White Coats for Black Lives organization that was born out of the movement. They are connected with 83 representatives of various medical schools throughout the country and are in the process of creating a national board for their student organization. They will also be actively involved in working with faculty and leadership to achieve the goals identified during the leadership retreat.